Following on my previous post on Getting Starting with Open StreetMap for Nepal, I wanted to look at the open datasets and GIS shapefiles that people have been sharing. Given the lack of additional data and poor satellite image resolution, being able to delineate Village Development Committee (VDC) would be great help, in my opinion. Here’s how to setup the JOSM tool to do so. We’ll get the data from HDX Data repository in the form of zip files to open in JOSM. My base system is Mac OSX – Linux and Windows are somewhat similar (all you need to know is Preferences are under the Program Name menu in OSX and under Edit in Linux and Windows). 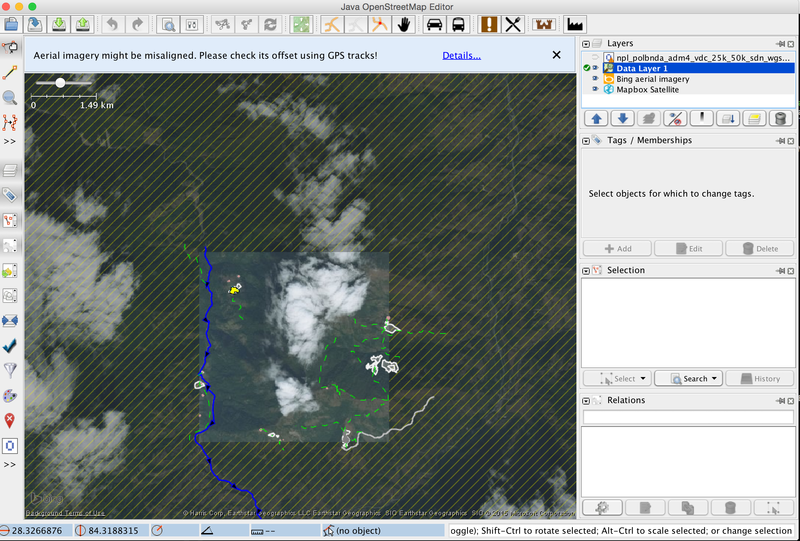 Get the relevant version from http://josm.openstreetmap.de/, I think the jar file is good enough on all OSes. If you’re okay with commandline, run java -jar josm-tested.jar or just click on the jar file or application. 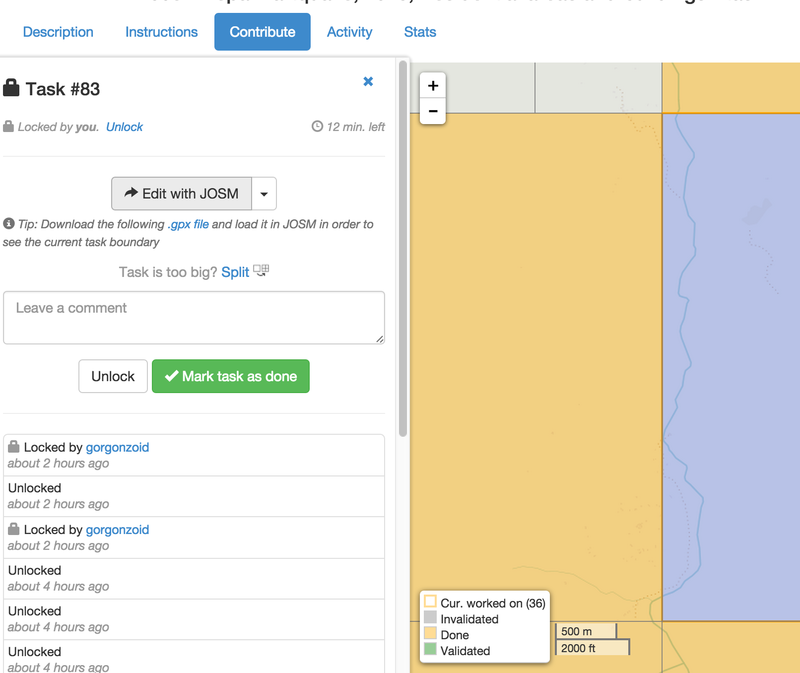 The way JOSM works with rest of OpenStreetMap is that it opens ports on 8111 and 8112 for external applications controlling JOSM. Go to JOSM > Preferences and click the remote like button on the left side. It took me a while to see the tabs on the left. Enable Remote Control in the screen. You’ll be asked to restart the application for the changes to take effect. The JOSM window should open the right location with the proper layers. Download the dataset from https://data.hdx.rwlabs.org/dataset/nepal-admin-level-4-administrative-boundaries-cod. It will be a zip file named npl_polbnda_adm4_vdc_25k_50k_sdn_wgs84.shp.zip. Open Preferences and Click on “Configure available plugins…” icon on the left. It’s 4th item from the top as of 2015-26 release. Search for OpenData and select it. Once you’ve selected it, press ok.
Go to File > Open and navigate to the zip file npl_polbnda_adm4_vdc_25k_50k_sdn_wgs84.shp.zip that you downloaded earlier. This will show up as a new layer on top of the existing map. You can enable and disable the layers from the right hand side. I’m currently using this only as a guide to avoid pushing something upstream that breaks things. 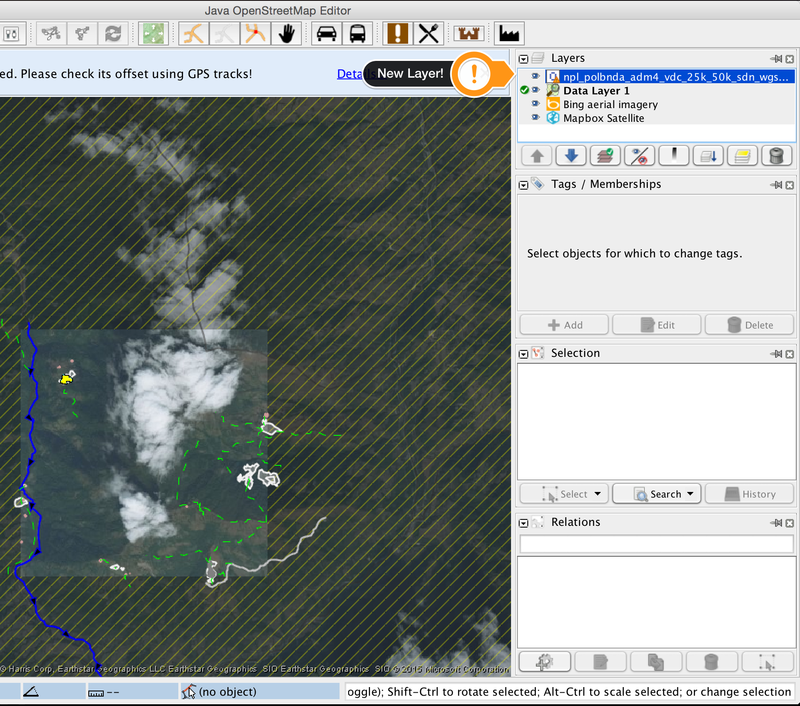 You can download more datasets and shape files to guide your mapping work.